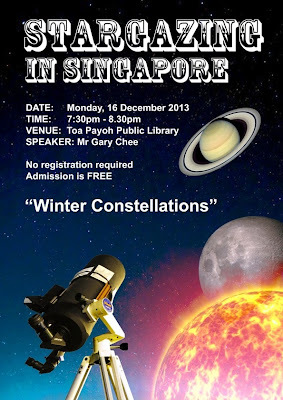 The next public stargazing talk is titled "Winter Constellations". Learn about the interesting constellations and celestial objects that will be gracing our night skies for the next few weeks! There will also be updates on recent astronomical events, e.g. Comet ISON, Geminid Meteor Shower, China's lunar rover ...etc. *Weather permitting*, during/after the talk, there will be an impromptu live stargazing session at open ground just outside the library. You can observe Stars, Jupiter, Venus and Moon through our telescopes! This will be the last Monday stargazing talk this year. Starting from 2014, these stargazing talks will be conducted on the first Saturday of each month (unless it's a public holiday). Big thanks to National Library Board and Toa Payoh Public Library for allocating us these prime-time weekend slots! So do continue to bring your family and friends along and acquire skills that will enable you to enjoy stargazing for the rest of your life! Weather permitting, you may see "shooting stars" (meteors) tonight, 13 December 2013 and the next couple of nights and early mornings before dawn. These meteors apparently seem to radiate from the constellation Gemini and that's why it is named Geminid Meteor Shower. Due to the appearance of bright Moon, the best time to catch them is after midnight and especially the couple of hours just before dawn. But if the meteors are bright enough and the sky clear enough, you may still see them when the bright Moon is in the sky. So don't give up too easily. A friend of mine already spotted a couple of meteors during our sidewalk astronomy session on Monday (9 Dec) outside Toa Payoh Public Library. Go to a dark location away from city lights if possible - e.g. Changi Beach, Marina Barrage, nearby parks. Else, try roof top sky gardens to get away from glaring lights at ground level so you can dark adapt your eyes better and potentially see more meteors, especially the dimmer ones. Which part of the sky to look at to increase your chances of seeing the meteors? If you have the patience, best is to lie flat on the ground, look up and take in as much of the sky as possible. Else, try to face North East from sunset till midnight. Look straight up from midnight till 3am. And finally North West from 3am till dawn. Since Jupiter is in Gemini now, if you can identify this planet (it looks like a bright star), you can look in the general direction of this planet as it move across the sky throughout the night and early morning. Do bring a binocular or telescope along and enjoy observing the stars, nebula and planets in the sky while hunting for meteors! Saturn is visible shortly before dawn rising in the east! Install free planetarium apps like "Sky Map" for Android phones/tablets or "Planets" for iPhone/iPad to assist you in locating the constellations, stars and planets. Most meteors travel very fast across the sky - less than 2 seconds. You can observe this speed from the following video by Mr YK Chia who captured some meteors in Singapore. The probability of meteors appearing for this Geminids is about 1 to 1.5 meteors per minute. So be patient and keep your eyes on the sky. Do tweet #meteorsg if you spotted any meteors in Singapore! Good luck and happy meteor hunting!